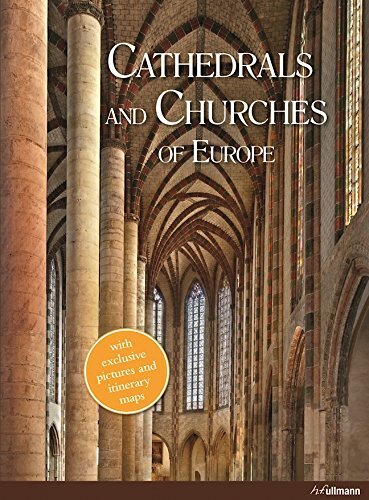 This marvelously illustrated volume takes us to a journey throughout Europes most beautiful and magnificent sacred buildings. As the very heart and center of most cities and villages, churches, cathedrals and basilicas have shaped the regional landscape in Europe to a great extent. Their architecture bears witness to the matchless skills of craftsmen and the mystic fervor that led to their building. Their century-old stone and stained glass tell the story of power and glory, sacrifice and devotion. Sorted by country and region, there is one chapter for every important area in Europe. The beautiful photographs by Achim Bednorz show the stunning details of richly ornamented ceilings, lead glass windows, colorful carpets and solid stone walls. The accompanying maps guide lovers of churches and cathedrals to the portrayed monuments. Throughout its 11 fascinating chapters, this book reveals some interesting details about the buildings, their architecture, the interior, their artful embellishments and their sacral and historical meaning. This book is a must-have for people interested in Christian sacral monuments, their history, architecture and interior.